Recently in Northern Ireland, inspections have highlighted a discrepancy between outdoor and indoor learning environments. 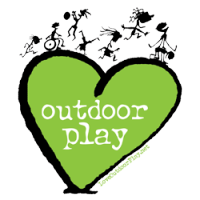 Some educators have taken this to mean that true learning takes place indoors whilst outdoors is more for 'free play' and where children let off steam. A main reason for this misconception is that initial teacher training doesn't spend a lot of time on high quality outdoor learning, after all in most primary schools, teachers don't often go outside with their classes. They say be outside during break time in a supervisory role but are not actually outside with their own class engaged in meaningful, sustained learning. Anyone who has been on a playground with 100 plus children will know it can only be a mere supervisory role, you cannot get involved in any in depth play with that many children, nor can any child get into deep play in just 15 minutes. 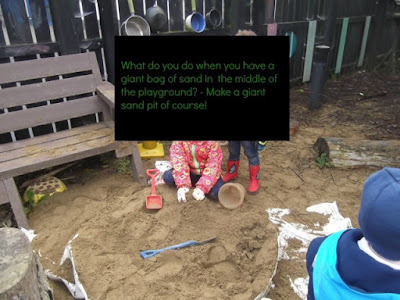 I would ask any primary colleague to try taking their class outdoors for over an hour at least once a week, then they will begin to see true learning through play. They will witness richer language and more social skills in operation than you can ever see when children are sitting indoors behind desks. As educators we can't believe that children only learn during school hours, they are constantly learning and have been since birth. If you think of all the skills an average 3 year old already has aquired by the time they start preschool, it is quite mind boggling. Many are now coming into school with a basic understanding of a second language. The vocabulary a 3 year old has is amazing if you think that they have probably only been speaking for over a year, on average. Last week I watched as my class got to experience many curriculum topics in a concrete way whilst outdoors; they watched the postman & food suppliers deliver to the main school, they saw the caretaker fixing things around the school. They don't need to do a jigsaw of a postman or read a book about delivery people to understand rather topic of 'People who help us'! They saw & felt Autumn last week as strong winds made leaves rain down on them in the playground, as a local gardener burned leaves they could also smell it. How much more meaningful is that than hearing me talk about Autumn? One day a child announced they were trying to 'stabilise' the seesaw, by putting a log under one side of it, since then I have heard others reuse this word in the correct context several times & they even managed to stabilise a plank enough for them to walk between a large tyre and a cable reel. As educators of young children, the sooner we realise that learning is constant with those in our classes and that they can learn anywhere and everywhere, the sooner we will begin to see the potential of all environments. And unless you have a vast indoor space, there are some skills that can only be learned outdoors, like rolling down a hill, climbing up a slide, jumping off a table, moving heavy logs etc. I firmly believe that resilience is best honed outdoors and that it is the key skill anyone needs to remain a learner. All children are learner but sadly some soon learn that their style of learning is not compatible with output more static education system. 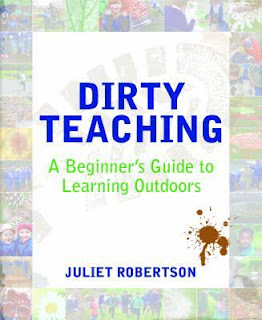 My advice for all educators: get a copy of Juliet Robertson's 'Dirty Teaching' for your school and start seeing the potential of your outdoor space as an equal learning environment. 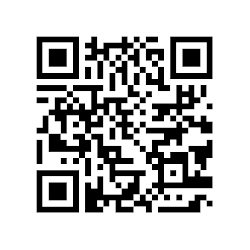 In the summer I was lucky to attend #niedcampin Belfast and whilst there I heard the word 'free' mentioned by one of the exhibitors & rushed over to see what they were talking about - all educators love to here about free resources! OPAL (http://www.opalexplorenature.org/northern-ireland) were offering sessions to schools to help promote environmental awareness. I go their details and actually emailed that same day to chat about them coming up to work with my nursery class, most sessions are free but the magic potions one I wanted to use first entailed some travel expenses for the trainers. But I thought this was a small price to pay for a fun activity & I was right! After the fire was all over & cooled - the children 'cooked' their own marshmallows!! Patricia & Rachel arrived on one of our 'Outdoor Days' - when we spend the morning outdoors & light the fire. By the time they arrived we had already had some hot chocolate with mini marshmallows & it was a bright, dry crisp Autumn morning. Patricia explained they were going to use all their senses to make some magic potions - we all walked up the little hill towards Bear Woods & the children then had to gather up 5 different ingredients to fill up a bucket. They had to find something green, yellow, smelly, bumpy & crunchy - the parsley was very popular as a smelly thing! Once the bucket was full we all walked back to nursery & the children watched as Patricia explained they had to tear some of the things collected into tiny pieces and put them into their 'potion pot' - I was very impressed that so early in the school year all the children were able to share a pot between two with no squabbles. Patricia then showed them 4 bottles with coloured water in them (but it was wasn't coloured water oh no!) - the green one was filled with caterpillar bogies, the yellow one had sun drops, the blue one moon drops & the red one was autumn! Each child go to pick a colour to add into their potion pot & they all had a magic wand to help stir the potion. Patricia added ground up tree roots (baking soda) and then some lemon juice - the children were enthralled as the potions bubbled & fizzed and spilled out of the potion pot. Each child got to keep their magic wand ( a small stick) and got to choose either a witch or a wizard mask to colour in at home. This was such a great activity and the children had so much fun and were chatting about their magic potions for the rest of the day. 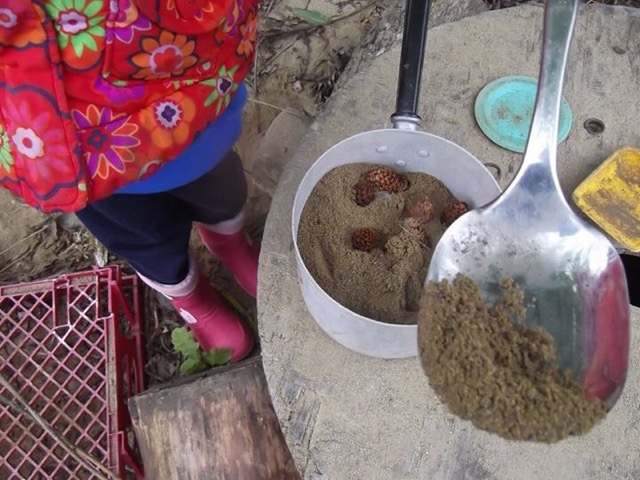 We placed the potions into the mud kitchen for them to play with tomorrow. This is definitely one I'd recommend to any schools & especially those in the Belfast area, as it is completely free to them. A massive thanks to Patricia & Rachel. I first came to teach at my current school in November 2001 and was reminded of this earlier this month when one of my nursery students from that first class came back to work as a childcare student two days a week. She had fond memories of nursery and recognised some of the resources from her time in the class. Nursery people are renowned for hoarding resources for years and years & a sign of a well established setting is the wealth of 'old' resources they will have and the patina of their Community Playthings blocks, the darker the blocks, the older they are! But this also means we end up with stuff well past its use and this week, it was time for me to accept our set of 4 mega sketchers had had their day. The stampers no longer left any impression on the 'screen' but even more telling, not one child had a clue what they were! I want to replace them, as they are a handy resource to put out after lunch when we just have around 15 minutes of playtime before getting ready for home time. This led me to look for new ones in a catalogue and I was stunned to discover that almost all toys now come with batteries, I have found one replacement that is just a simple drawing tool with no lights, noises or changing colours. I realised that most toys are now over stimulating our children & have a very prescriptive use - very few are open ended. This is another reason I firmly believe in loose parts, young children, generally have fantastic imaginations and don't need resources to look anything like the thing they intend to use them for. 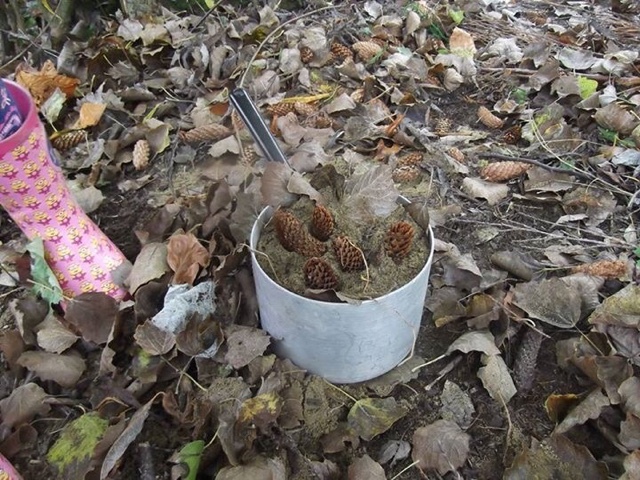 However, the fact so many toys do so much for their young users, does explain those children who struggle with loose parts and appear lost in our playground, those are the children who will be heard saying 'But it's just a stick/block/bucket' as their peers make those same objects into anything they need them to be. I 'acquired ' several large supermarket crates last week and set them out in the playground, upturned, thinking the children would climb on them & make an obstacle course. Silly me, I should have learned over the past 14 years that 3 & 4 year olds never, ever see resources the way we as adults do! After climbing over them once or twice, they moved them away from the Tarmac, turned them over, lined them up & hey presto created a train! For 4 days they have constantly played with them, they introduced the 5 minute timer to ensure fair turns as a driver & have been to Dublin, the beach, the zoo & generally on holidays. I suspect the only child who has actually been on a train is the one who was heading to Dublin but they all know about trains & quickly brought into this play. Now, I just need to acquire 26 of the crates to allow a whole class train! Even more fun has been had with a large quantity of sand we now have in the forest area - it was left over after the wall was replastered. The weather has been so dry the past few weeks so the children have loved sitting in the midst of the sand just digging, filling & pouring etc. 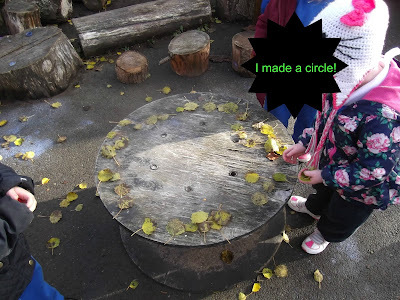 One day we gathered leaves from the front of the nursery and then these were incorporated into their play too. Another child had brought us in a load of pine cones and these were added to the forest area and are now the main ingredients in most of their 'cooking'. Anyone for stew or chocolate cake? Inside one day, a child wailed that another had taken their tablet off them. Knowing we don't have the iPads out for general use yet, I wondered what she meant until I saw the other child swiping a placemat in the house corner! So,seriously I have to wonder why toys are getting more and more dependent on technology and batteries to entertain children who can have as much, if not more, fun with sand, sticks, crates & placemats! Team work was needed to create this castle. After 5 weeks the nursery class have managed to blend together into one big class of 26, they had been in 2 separate groups for 3 weeks but for the last 2 weeks have enjoyed getting to know each other and enjoy being in a much bigger group than any of them have ever been used to before. There are lots of firsts in the initial few weeks at nursery: saying goodbye to their parents, taking turns with toys, waiting for turns for an adults attention, putting on rain gear, taking off & putting on their own shoes etc., listening to a story in a big group, having lunch and dinner in nursery, going up to Bear Woods and making lots of new friends. It is no wonder that lots of parents report that they child is exhausted after a full day at nursery. It is always interesting to watch how the 2 groups play differently and then whether this distinctive play stays the same when they join into the bigger class. For the first time in many years we have more girls than boys and whilst I don't like to stereo-type, they play can be very different. So far this class explores different parts of the playground as smaller groups e.g. 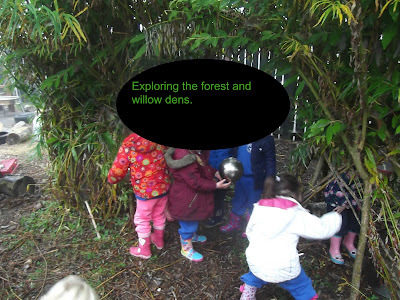 it took 3-4 children going into the forest area for more to get their boots on & enjoy playing in the willow dens. Amazingly this morning was our first wet outdoor play time - which is pretty good for 5 weeks. 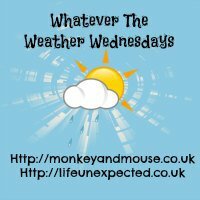 It is always better to get a few weeks of good dry weather under our belts before a wet day, as the children are better to have enjoyed wearing the rain gear to play in the mud kitchen by choice rather than having to wear it because it is so wet. On very wet days we always bring out the powder paints and allow the children to use the rain to make paint and decorate the playground. It was lovely to watch a small group enjoying just sitting in the rain today, painting some of the tree stumps whilst others played in the mud kitchen, making soup and hot chocolate. Powder paint & rain - the perfect combination. Each month we try to reinforce a different colour through a painting activity and the play dough. 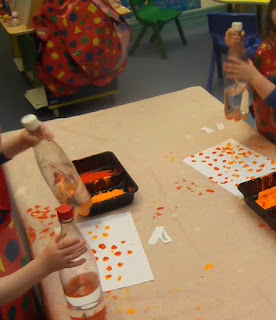 So today the children had fun making different coloured orange prints with some bottles. An orange wall display for October. It will be interesting to see what the next 5 weeks brings for us all.